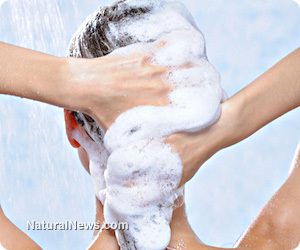 (NaturalNews) Most people use a shampoo to wash their hair on a regular basis; however, many of those people aren't aware that this common hair care product may contain ingredients that could be harming their health. For many, their choice of shampoo comes down to cost, brand, perceived effectiveness or even fragrance; however, a growing number of consumers are now reading the ingredients on shampoo bottles and basing their purchasing decisions on safety. Shampoos are generally made from a mixture of water, some form of foaming agent and a variety of other ingredients that combine to make a product that smells good, looks good and appears to do its intended job of cleaning hair. But some of the ingredients that are commonly used are harsh chemicals that have been shown to be potentially harmful to human health, either individually or in combination with other ingredients, and may pose various health risks ranging from skin conditions to cancer. Regularly contaminated with Ethylene Dioxide and/or 1-4 Dioxane, both of which are extremely hazardous. They may cause cancer and reproductive problems and are toxic to most body systems. When confronted with this information for the first time, consumers are often shocked and upset; it is natural to assume that personal care products are safe for us to use. Unfortunately, this is not always the case, and profits are the motivation for many companies. It is safe to say that human health and safety are not priorities for the companies that use these ingredients. Consumers have the power to change the decisions that companies make about the formulation of products, encouraging manufacturers to use safer ingredients by educating themselves, asking questions, reading ingredient labels and changing purchasing habits. The good news is that there is now a growing trend that sees companies creating safer personal care products. Manufacturers are gradually getting the message from customers who are learning about the health hazards in their shampoos and switching to safer brands. By voting with their shopping dollar, consumers have the power to demand safe products, changing the way businesses do business and creating a better future for all people and the planet they live on.